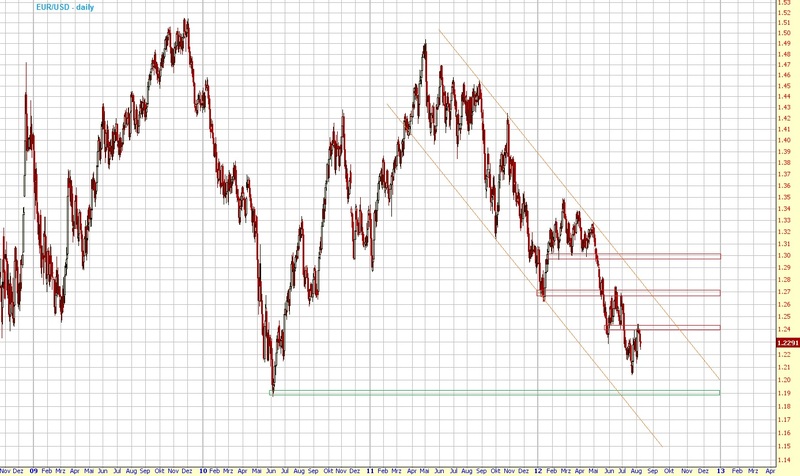 As you can easily see in the chart above, the long-term trend is still down and the medium-term trend is up. 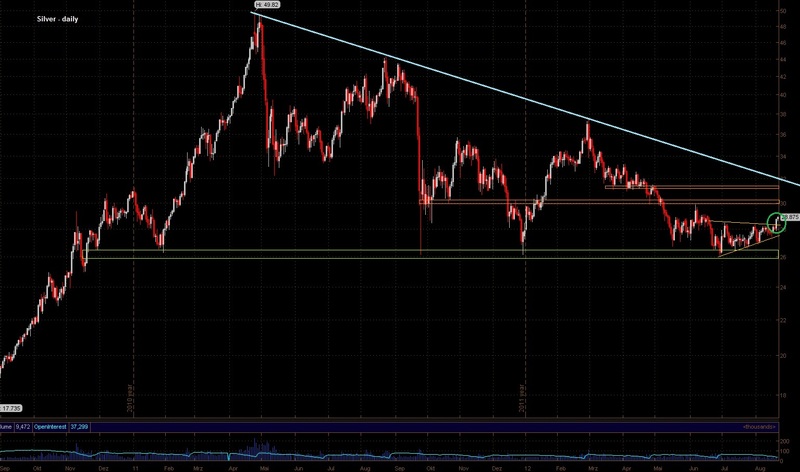 If 1.24 is broken again, the medium-term trend is down again and we'll most likely drop to new lows. Should the EUR/USD break the long-term downtrend line though, the next target should be 1.30ish. Since Bernanke speaks tomorrow, I don't really expect much more downside today though. More likely, we'll stay between 1398ish and yesterday's range. Not much is going on right now... It looks like everbody is waiting for the (non-? )event on Friday. As you can see, we're at an important level. 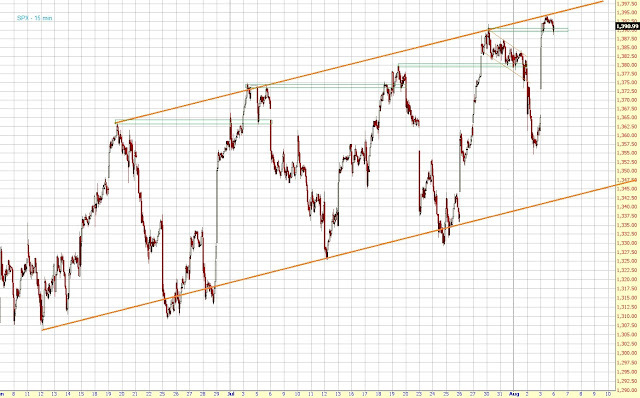 If we can breach 31-32ish, the long-term trend is up again. 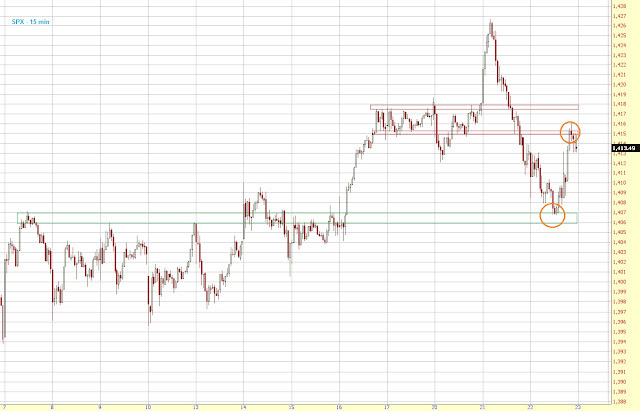 The SPX hit the support at 1407ish this morning and is now rallying. If we can break the neckline at 1416, we should see new highs. It looks like the SPX is forming an inverse H&S. 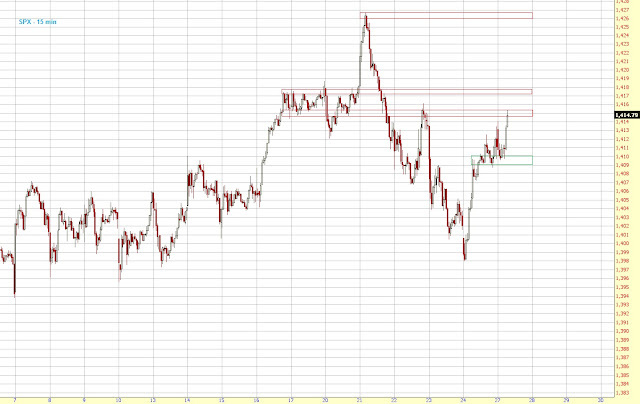 If either 1407 or 1409 holds and then 1416 is broken, we should see a huge rally to new highs. 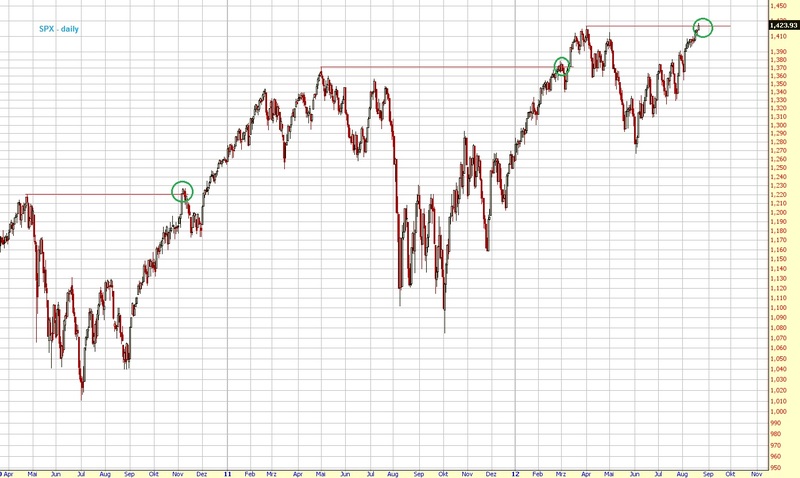 If the area around 1409 holds, we should see new highs soon. The market hit the target earlier today and is now rallying. It looks like we've completed a zigzag from the top. We need a break above 1408 though to confirm it. 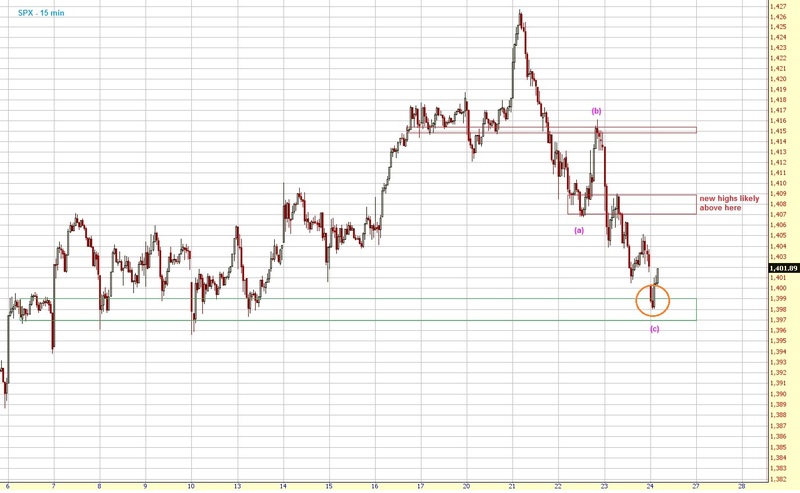 Next target should be the 31.5ish area and the downtrend line around 32 (depending on how you draw it, it's either a bit above or below 32). As long as we stay above 28, the medium-term trend is up. 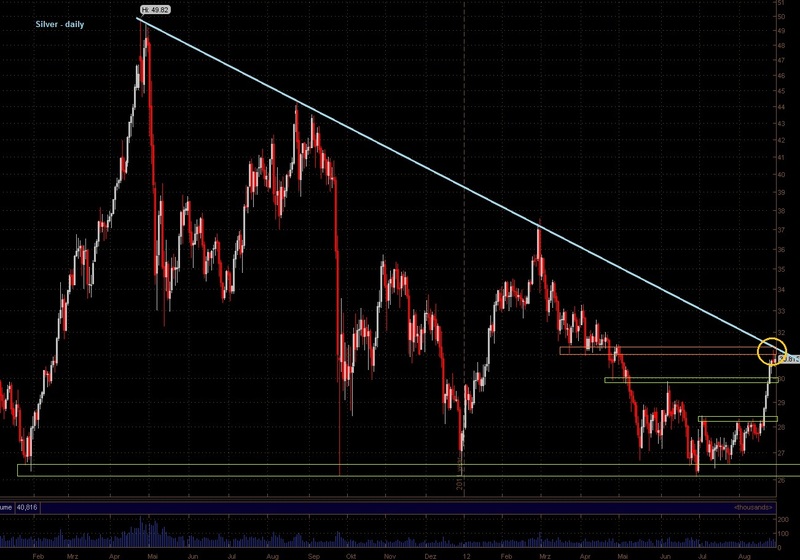 If we can break the downtrend line, the long-term trend is bullish again. The next targets are 1720ish and 1800. Since 1640 is breached, the medium-term trend is up again and remains up as long as 1630/40 holds. 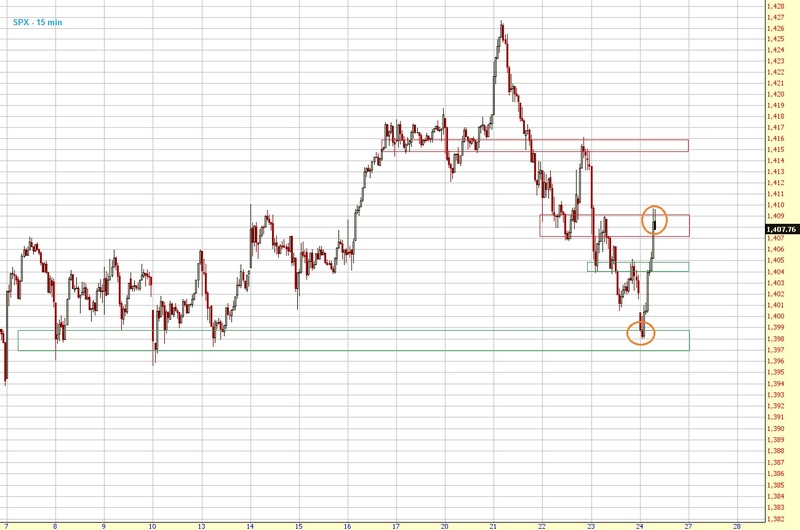 If this level breaks, the next target should be around 1398. 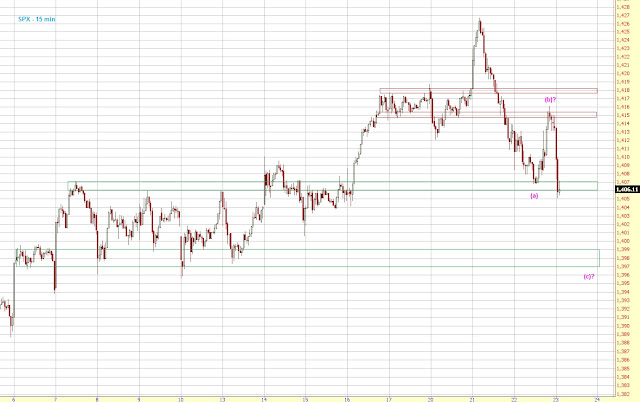 We're at the support around 1406ish. 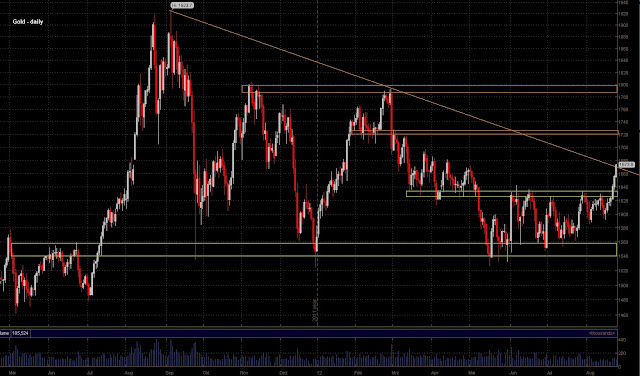 If this level holds, we should see bounce, probably up the resistance around 1416ish. It looks like the correction, I talked about yesterday, is underway now. 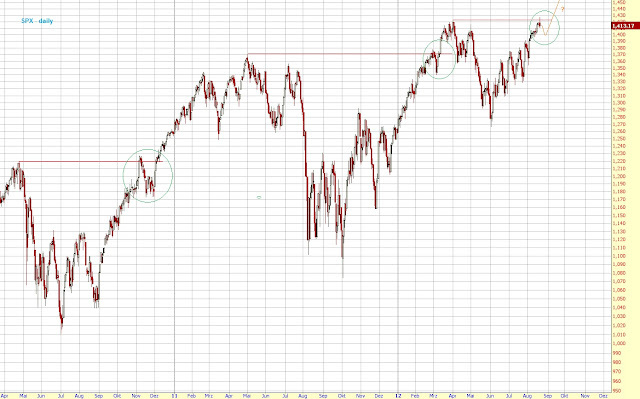 As you can see in the chart above, after a new high was made, the SPX usually corrected for a few days. 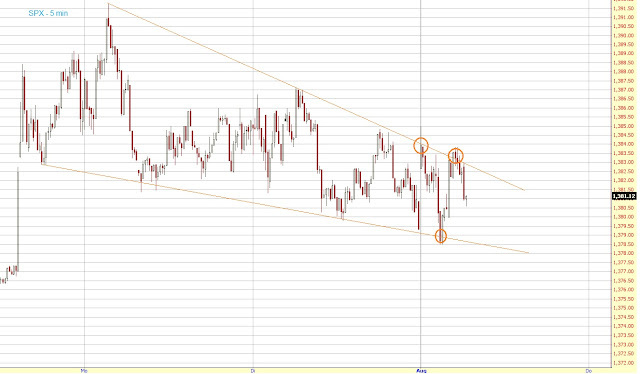 If we can't convincingly break the 1425ish area, I think we'll get the same pattern again, i. e. a correction to 1400ish. 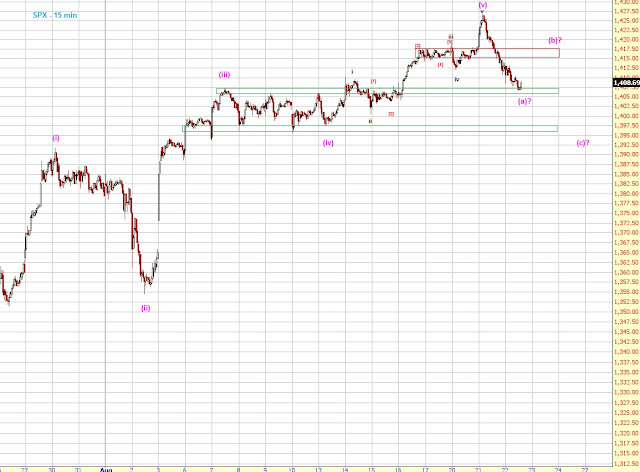 Next targets are 30ish and 31.5ish. If we can breach the declining blue trendline, the long-term trend is bullish again. Gold as an investment opportunity is something that has to be read in a completely different way than most other investments. Normal stocks and commodities can be looked at through long-term trends and financial forecasts based on a number of different factors. Changes in the values of these stocks can be predicted based on the success of different industries and companies, etc. Gold, on the other hand, is not typically prone to sudden drops or rises in value, and thus needs to be predicted and analyzed in different ways. The first thing to note is that the term “gold investment” typically refers to the purchase of gold bullion at sites like bullionvault.com. 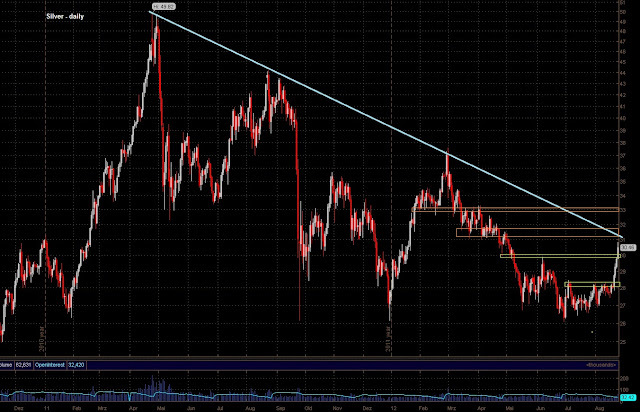 However, gold mining companies can sometimes be traded, and work a bit more like ordinary stocks. Gold bullion is an existing commodity rather than an active company, and its price depends more on its relation to greater financial markets and currencies than on its own production. With that in mind, here are a few factors that can help you to recognize potential trends in gold prices. 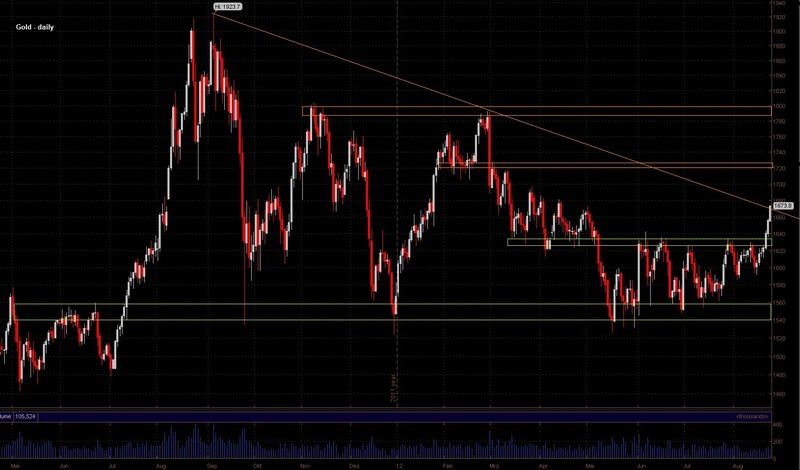 To begin with, production has minimal impact on trends in gold prices. While gold is still mined all over the world, the enormous majority of gold in circulation has already been mined, meaning that the impact of what little proportional amount is mined in a given month or year is very small. This is a very important detail that differentiates gold from traditional stocks. If you happen to read about gold mining and expect any spike in gold prices, you should always remember that most gold is already in circulation, both in its simplest form (raw gold bullion) and as jewelry or decoration. On the other hand, the production of and the strength of currencies in major economic systems do strongly impact the price of gold. Gold does not “belong” to any single financial system, nor is it directly responsible for backing the currency in these systems as was once the case. However, because gold is a valuable commodity and can be purchased freely at any time, it does often serve people as a sort of buffer against financial uncertainty, and when more people are taking advantage of this idea, the price of gold can rise. Essentially, as economies around the world weaken and their currencies become devalued, people begin to worry about their wealth losing its value. It is in these situations that some people choose to purchase gold as a more stable alternative to actual currency. Of course, this is actually very complicated, particularly when the European and American economies are not fluctuating in sync, but in general strong economies mean lower gold prices, and weaker ones lead to higher prices. This is a Bullionvault guest post, written by freelancer Mark Sanderson. 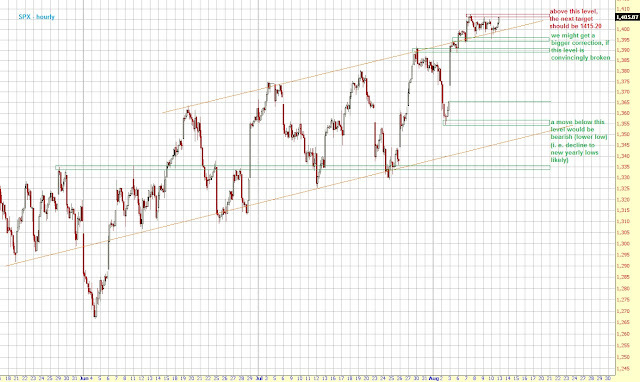 A break of either 1550 or 1640 should lead to a big move. 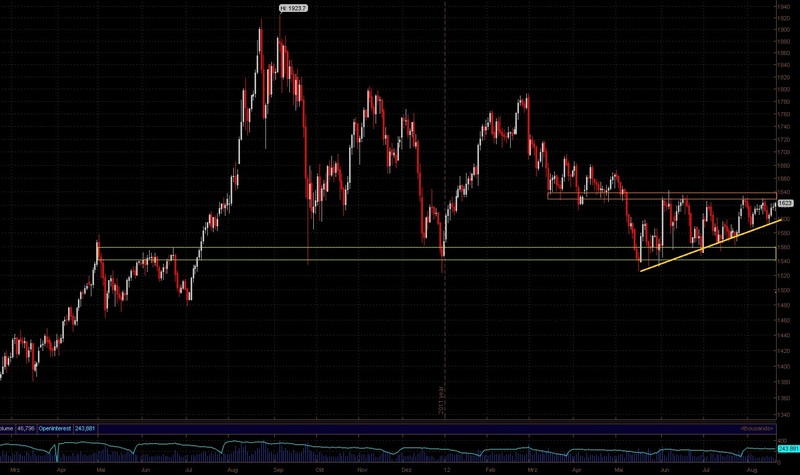 As you can see in the chart below, mid August till late February tends to be a good period for gold. 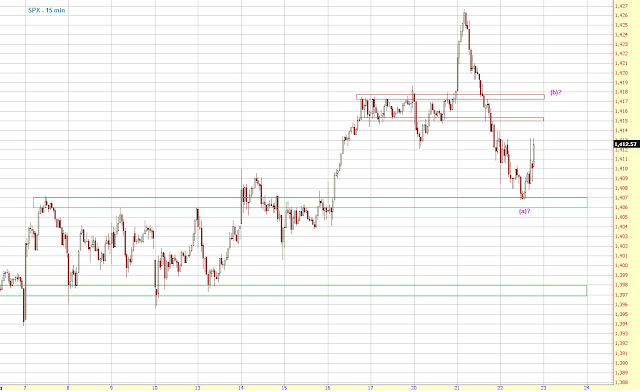 So, I think a break above 1640 is more likely than a decline below 1550. But we'll see. 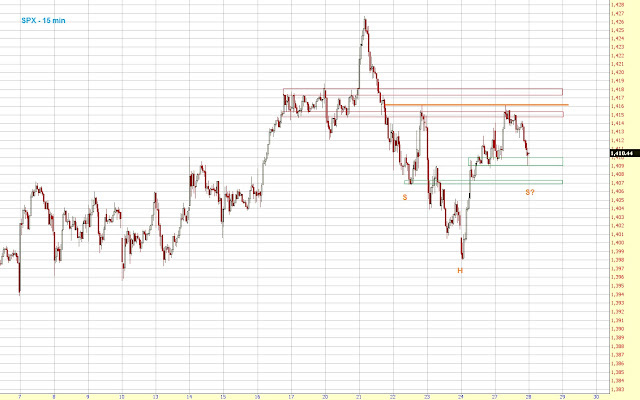 Resistance is at 1415-20. Supports are at 1407ish and 1395ish. In the army for another week. Daily and intraday updates will resume in a week. The SPX stayed always above 1387-90 last week, thus we never got a short-term sell signal. The market even broke above the resistance at 1395 and, as mentioned last week, this should lead to a rally back to the highs at 1415-20. 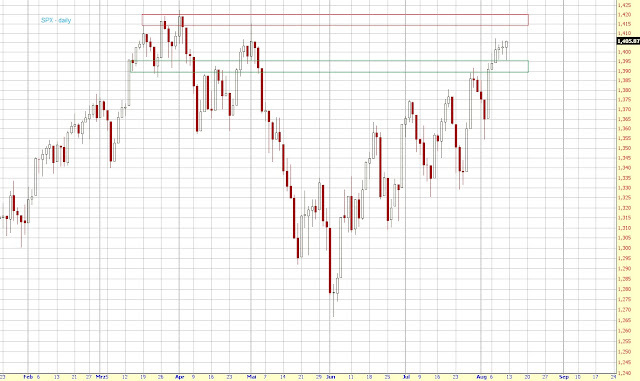 So far, we only rallied to 1407 and thus are still about 10 handles below the yearly highs. But as long as we stay above 1390/95, it should be only a matter of time before the target is hit. 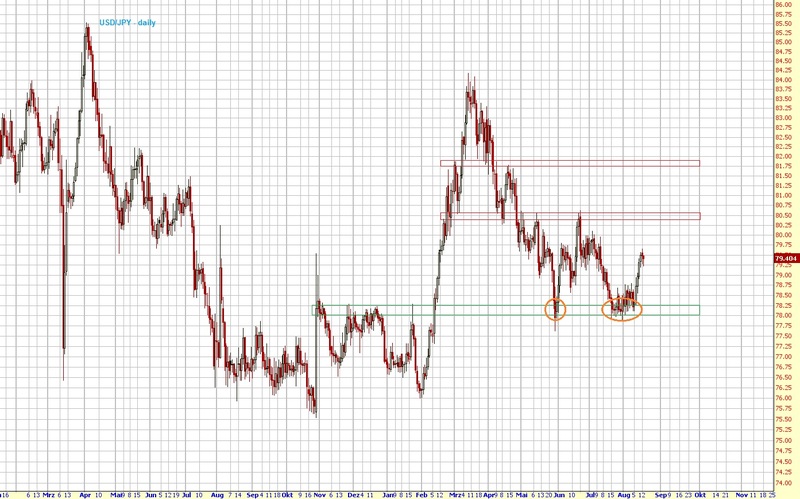 In the chart above you can see the series of higher lows and higher highs. 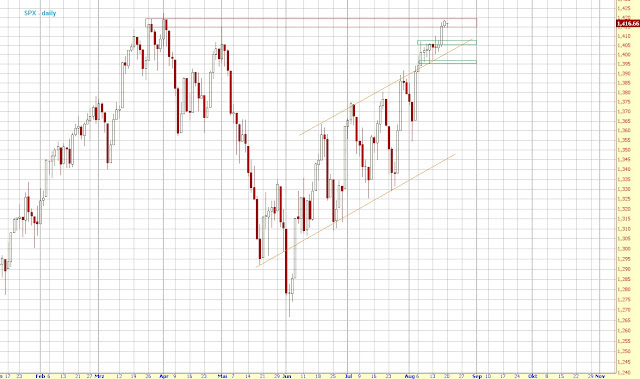 As long as this pattern persists (no decline below 1355), the medium-term trend is up. The EUR/USD rallied to 1.24ish but couldn't break it. 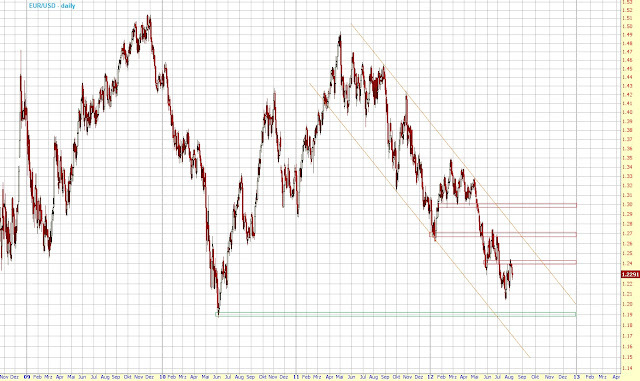 Thus, the medium-term trend is still down and remains down as long as we stay below 1.24ish. I'm sorry that I didn't post any updates on Thursday and Friday. Since last Thursday and until August 17th I'm in the army doing the yearly repetition course (as every other young Swiss man has to do). I was hoping that there was a computer with some basic software on it, so that I could post updates. But unfortunately there isn't. So, until August 17th there won't be any updates (except for next weekend). 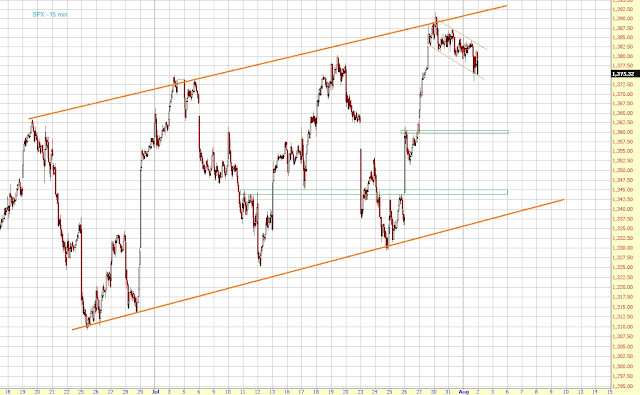 On Thursday, the SPX broke the small channel to the downside and sold off. We didn't quite get to the lower channel line (of the big channel) as I expected but we still got a decline of about 20 handles. On Friday, the market gapped up and rallied back to the upper trendline at 1390ish. As you can see in the chart above, the previous high always provided support for a short amount of time. Once the SPX declined below the previous high again, the uptrend was always over and a multi-day decline underway. 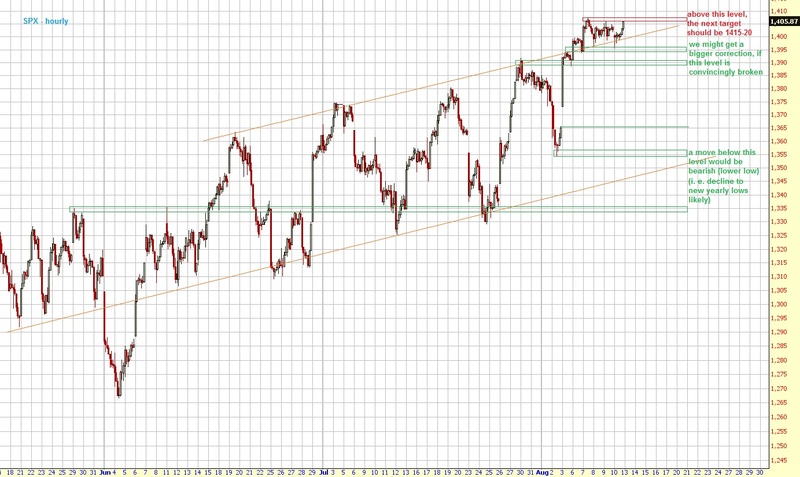 So, if we get a convincing break below 1387-90ish next week, the next decline should be underway. 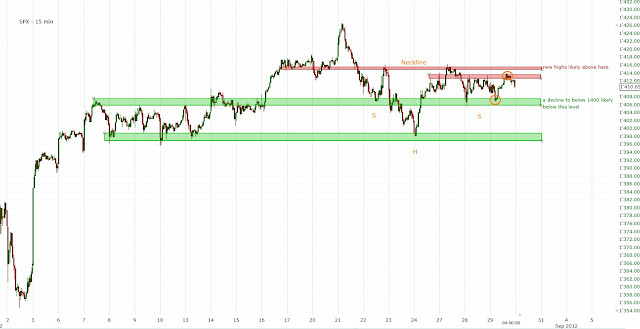 If this area holds, we should see a correction next week. 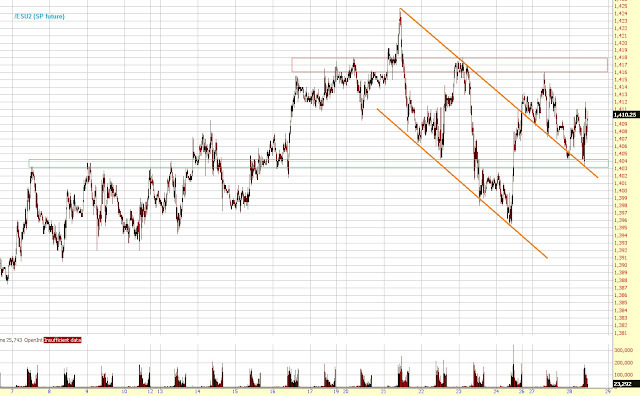 Possible targets are the open gap at 1365, last week's low at 1355, and the trendline at 1345ish. 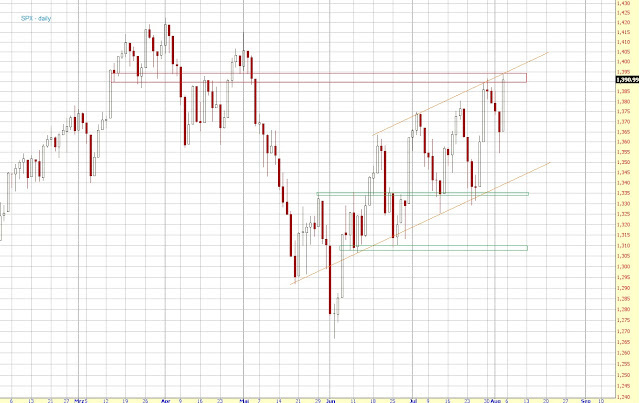 A break above 1390-95 would be very bullish and most likely lead to a rally back to the highs to 1415-20. Although we got some action after the FOMC statement, the decline still looks very corrective. Nevertheless, it's still possible that this week's high persists for another few days and we'll sell off to the lower trendline again. We'll have to wait and see which side the (small) channel breaks. So, we're still inside this wedge and we'll most likely remain inside it until the FOMC statement later today.